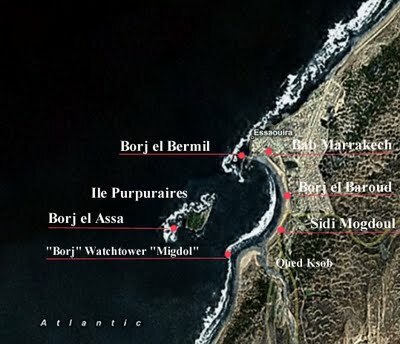 “The Portuguese Fort” and "Bordj el Baroud" or 'bourj el oued"
Late 18th century construction of defensive fortresses..
included also Borj el Bermil at the entry of the port, Borj el Assa at the island of Mogador ( Ile Purpuraires ) and Borj el Baroud south at the river Oued Ksob. 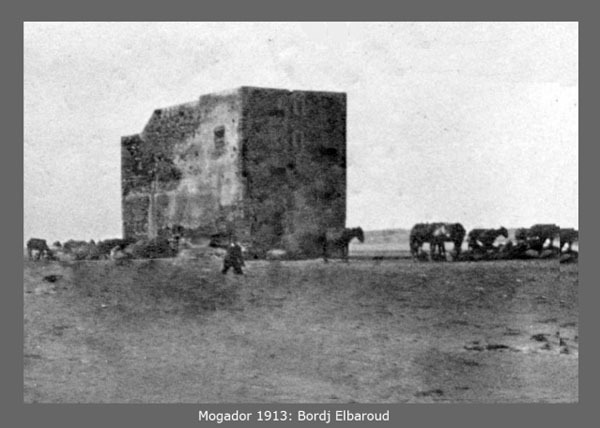 Borj el Baroud was an isolated fortress which served as a store for gunpowder probably situated somewhere between Bab Marrakech and Sidi Mogdoul. There are no traces left of it today caused by the new settlements and the construction of Boulevard Mohammed V.
It was reconstructed in the Sultan Sidi Mohammed Ben Abdallah times on the rests of an old fortress - probably Carthaginian and a "megdul" Phoenician . 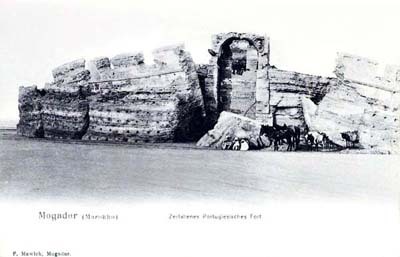 It served in the antiquity as a lighthouse with fire of wood.It collapsed the 13 january 1856 following a disastrous flood of Oued Ksob. There are many reasons to believe that this structure may have been an integral part of the Phoenician settlement on the Purple Island. The Phoenician word ‘'migdol'‘ for watchtower would justifie naming this place Mogador. A common name for Bordj el Oued is "The Castle in the sand" and it is a misbelief that this ruin was an inspiration for the song "Castles made of sand" by Jimi Hendrix. Jimi visited Essaouira a short stay in 1969 and the song was released in 1967. 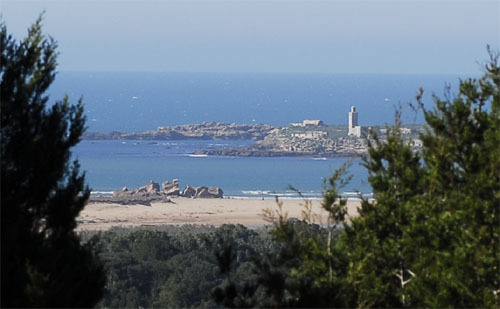 Borj el Oued with the mosque on the Island of Mogador. South side of the mosque there is a battery. Show the map of Essaouira Mogador bigger.